~ Nothing that exists remains in a state of repose. Everything is either growing or declining. ~ Kind forces are drawing us away from preoccupation with “fighting evil” toward creative, collaborative, and limitless building of the good. ~ We are here to mirror to each other the attributes of the Creator. ~ Every attribute and faculty we possess, known and unknown, comes into balance as we strive to align the acts of giving and receiving. ~ An eternal life begins when we begin to acquire what lasts forever. ~ The gift of this age, bestowed on all humanity, is the right each one of us has to investigate reality independently. ~ The natural outcome of that expresses itself in willing, joyful acts of service — the personal and collective pathway for building the good. How am I honoring and expressing that potential on my path? How will it free my heart from the weight of a world’s unreal illusions this week? 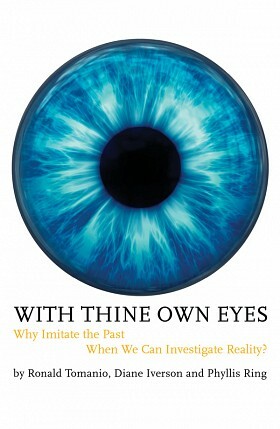 Authors Ron Tomanio, Diane Iverson and Phyllis Ring explore these themes in With Thine Own Eyes: Why Imitate the Past When We Can Investigate Reality?. Categories: On the heart's path, Sustainable Future, The divine in the details, With Thine Own Eyes | Tags: Building the good, collaboration, growth, illusion, independent investigation of truth, reality, service, With Thine Own Eyes | Permalink.